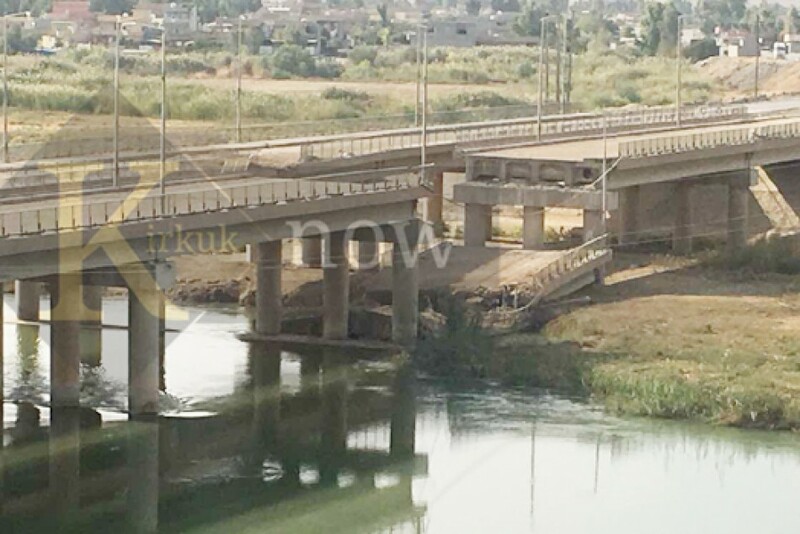 The main bridge between Kirkuk and Erbil which was destroyed more than a year ago is still awaiting restoration. The bridge built over the Little Zab river in Altun Kopri (Prde) sub-district north of Kirkuk was destroyed during the conflict between Iraqi forces and the Kurdish Peshmarga forces which broke out on October 16, 2017 after Iraqi forces retook control of territories disputed between the federal government and the Kurdistan regional government (KRG). Although the KRG built an iron bridge over the river to facilitate movement of civilians and goods between Erbil and Kirkuk in August 2018, the temporary bridge has been unable to hold the huge amount of traffic load and suffered structural defects. Abdul-Muttalib Najmaddin, Prde sub-district commissioner, speaking to (KirkukNow) said, “The KRG built the iron bridge on its own budget, but it couldn’t endure the massive pressure, which inflicted damages to the bridge”. He indicated that Prde municipality teams have embarked on repairing the damages and asphalting the bridge to facilitate traffic. Local officials criticize both the federal government and the KRG’s reluctance to rebuild the original bridge. The 128-meter long, 8-meter wide bridge, which is the main bridge between Kirkuk and Erbil, was built in 1984.